Magnisia, Magnesia, Volos, Bolos, Pelion, Thessalia, Thessaly, Flights, Holidays, Hotels in Greece. Volos, (326 km. from Athens, 215 km from Salonica) is the capital and economic center of the prefecture. Thanks to its privileged position at the foot of Mt. 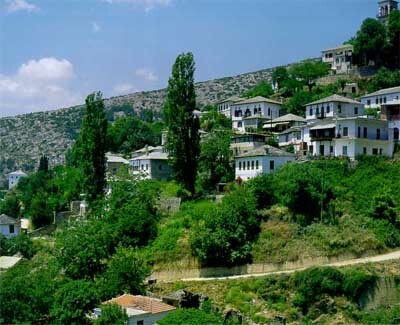 Pelion on the Pagasetic Gulf, it is a good base for enjoying the sea, wooded slopes and green valleys that surround it. As for the derivation of the word "Volos", which according to a Byzantine historian of the 14th century was called "Golos", there are several theories. The most widely accepted is that it represents a corruption of the Mycenaean Iolkos. Founded in the mid 19th century, modern Volos is a cheerful, lively town, soundly laid out with pleasant, broad streets. The waterfront is an ideal spot for a stroll. A modern coastal avenue bustling with life, it is lined with pastry shops, cafes and restaurants. From the suburb of Ano Volos, built up the slopes of Pelion, the Pagasitic Gulf and the town below take on another dimension. Volos harbor is particularly active. It is the main export center of Thessaly and the scene of much commercial and passenger traffic bound for the Sporades, the great ports of Mediterranean, Syria and other Middle Eastern cities. The city of Volos is situated at the center of the Greek mainland, at an approximately equal distance from the country's two main urban centers, Athens and Salonica. Built at the innermost point of the Pagasitic Gulf and at the foot of Mount Pelion, it is the only outlet towards the sea from Thessaly, the country's largest agricultural region. The greater Volos conurbation has a population of 150,000 and includes the Municipality of Volos with 90,000 inhabitants, the municipality of Nea Ionia with 50,000 inhabitants, the municipality of Iolkos as well as smaller suburban communities. From a population of 4,887 in 1881, when Thessaly was annexed to the Greek state, Volos has increased its size twenty-fold within one century. A combination of the knowledge and skills of the craftsmen of Mt. Pelion, the labour force of Thessaly and investment from the major centres of the Greek diaspora has enabled the city to develop into an important industrial centre with the third largest port in the country. The economy of the city is based on manufacturing, trade, services and tourism. Volos is developing into a dynamic European city with a new and modern university, an active cultural life and varied oppurtunities for leisure and entertainment. Pelion, land of the legendary Centaurs, the site chosen by the ancient gods for their weddings and celebrations, rises in lush magnificence to the northeast of Volos. It was here that the centaur Chiron, the wise teacher of demigods and heroes, gave his pupils daily instruction in the proper care of body and soul. Here, as well, the first beauty contest took place between Thetis and Eris. Many-leaved Pelion was an inspiration to Homer, Pindar, and Euripides but also to the modern popular muse who sung of the unquenchable desire of the Greek people for freedom. 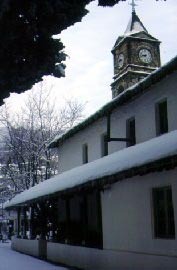 The highest peaks of Pelion (Pliasidi 1548 m. and Pourianos Stavros 1610 m.) are in the northern part of the range. Its inaccessible eastern flank, with the Aegean Sea stretching out into the distance like a vast mirror, comes to an abrupt end in the sea, creating wildly beautiful rocky shores. Conversely, the tranquil, calm coast of the western flank on the Pagasetic Gulf is much easier to reach and encourages shipping activity. Pelion's picturesque villages, sometimes clinging to wooded slopes or perched on steep bluffs, sometimes hidden away in verdant ravines, are so much a part of the scenery that, seen from a distance they create the impression of having "sprouted up"; along wiith the trees. The distinctive traditional architecture of the old houses with their narrow windows and decorated walls, stone stairways and roofs of grey or greeny slate; the Byzantine churches with wonderful wall paintings and icon screens; the winding cobbled paths, sculpted fountains, courtyards redolent of basil and gardenia; squares paved with huge flag stones where the cheeful bubbling of a little brook is never absent -are all typical features of a Pelion village.